Great to see you back for another installment of Judge of the Week! This time, we’ve got a judge article about a judge who oversees the publishing of judge articles. How very meta of us! Time to get to know a little more about Evan Cherry! Occupation: 3rd year medical student. Random fact about yourself: I’m allergic to Pepsi. Hives and rash. To help my local players and stores with rules and running events. My brother is 5 years older and brought it home from school. Of course he had the deck with the good cards and gave his little brother the crappy deck. The only way I stood any chance was to occasionally outplay him, and I learned to be pretty good at Magic. From there I played it on and off at school and while camping with Boy Scouts. First and foremost, Magic has really helped me meet great people and travel to cool places. I think it helped me develop the ability to deliver and receive criticism in formally writing reviews and face-to-face feedback. That’s an essential life skill especially as I go through many interviews with school. Also, I think it really helped build diplomacy skills in areas where I’m either: (A) absolutely right but have to teach someone without getting frustrated –or- (B) absolutely wrong and have to learn from someone without getting frustrated. 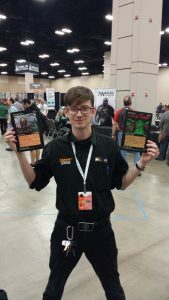 To improve your region, you taken on many roles including filing in for your RC at GP San Antonio. What did you do? What was it like? How much time did you have to prepare for the role? While I was in College Station, I was able to travel to most of the major cities in Texas and work with judges from all over the state. Because my schedule was flexible in school, I was able to attend the major events (SCGs, GPs) and meet judges from all over my region. In short, I was able to get to know most of the judges in my region. 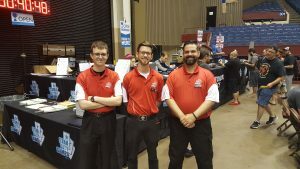 Standing in as RC at GP San Antonio was really just a matter of making time to see everyone that came, make notes of their progress, ask how we could help them, and relay their goals to our RC. It was a lot of fun to wear the “Blue RC tie” and work on building community. It gave me a lot of experience testing L2 candidates and giving detailed feedback during the debrief. I had weeks to ask Kevin Binswanger questions and meet expectations for the role. You’ve also received a lot of recognition for the Judge Article project. Could you tell us more about the project and your contributions? The Judge Articles project is a source of high-quality Judge information with the specific purpose of educating Judges about any Judge-related topic. We only expect that the authors choose material they are passionate about and provide sufficient detail to make the material educational to the general judge audience. We’ve hosted some tongue-in-cheek humorous pieces, some detailed primers, and I’m really proud of the L3 Qualities series which continues to be a great source of information for L3-oriented Judges. I was recruited to the Judge Articles project by Lems after I’d helped him move an older project onto judge blogs using WordPress. I was working with Stefan Ladstatter and David DLI in formatting and publishing articles. They gave me a lot of free reign to choose how to format it effectively and choose the little cardimg tags to give the articles more personality with the game. Eventually Stefan decided to shift his attention elsewhere, and I was honored to be designated as the Project Lead. I was able to recruit a distinguished team of reviewers and thanks to lots of volunteer effort, the project has grown in scope and volume over the years. I serve as “Editor-in-chief”, communicating with the authors, passing along submissions to the review team, formatting the article, and publishing when the submission is ready. Judging from your recognitions you spend a lot time contributing to the program. Do you have suggestions to other Judges on how to balance the hobby with other life priorities? Don’t sleep. Seriously though, focus on things that are important to you and manage your priorities. There will be times when real life has to be more important than Judging, and times when Judging will help enrich your life in other areas. Be passionate about what you do, and don’t focus too hard on one or the other. 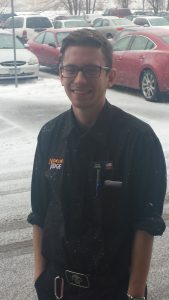 I like to help others by developing other Judges, helping stores increase attendance, and getting to know more players. My LGS is very casual and everyone tries to have a good time. I really enjoy making music. I play violin, guitar, and piano, and it’s very therapeutic when my stress levels are high. What’s the biggest rule-breaking play you’ve ever made as a player? Oh God. I think it was casting Black Sun’s Zenith to again trigger Undying with a Geralf’s Messenger with a +1/+1 counter at my local Game Day back in Scars/Innistrad standard. I wasn’t great with SBA’s back then. I’m pretty rusty when I play Magic, so I tend to break rules or forget triggers when I’m playing because I’m watching people around me. Pro Tour Honolulu 2014 was my first and only PT so far. It’s an entire experience and the Judge staff was phenomenal of course. Being around that many quality Judges and players made the event really smooth. I was chosen to lead coverage on Day 2 and it was an amazing opportunity to handle the technology and work with Wizards staff. I’m more confident knowing that I’ve helped others and have shown and received a lot of appreciation over the years. I’d be doing what I’m currently doing: studying to become an oncologist. We had a player at a Texas States tournament whose deck was designed to use Epic Experiment to overload a bunch of spells and win the game. The funny thing is that this doesn’t work because you can only use one alternate cost to cast a spell, either free or Overload. This deck went entirely unnoticed until the 2nd to last round because no one ever challenged it. The player felt really bad when I pointed it out and asked if we could go back and give his previous opponents the win. Fortunately, he was at the lower tables all day and his opponents were pretty relaxed. How do you have fun during events? I love to talk to the other Judges, players, and staff. Helping others have fun is a great way to have fun. 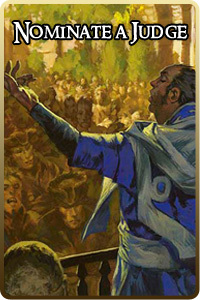 If you were a Planeswalker what would be your ultimate? I failed the Rules Advisor exam >3 times. I have driven away with a gas pump still in my car twice. I’ve delivered a baby in a taxi cab. Rick Salamin has not met two U.S. presidents!